As many Japanese look back on the social movements from the 1960s and 70s, such as the Anpo movements, environmental movements, as well as feminist movements, their activists are most often represented as aggressive, militant, dangerous, and even crazy. Today, we see what some have called a sort of “political allergy.” As a result, many who are politically active today first seek to distance themselves from this imagery of activists and the accompanying stigma. However, many women have been ‘active’ for years in community-based organizations, such as parent-teacher associations and consumer co-operatives, exerting influence over everyday politics in their local communities in ways that avoid these stigma. 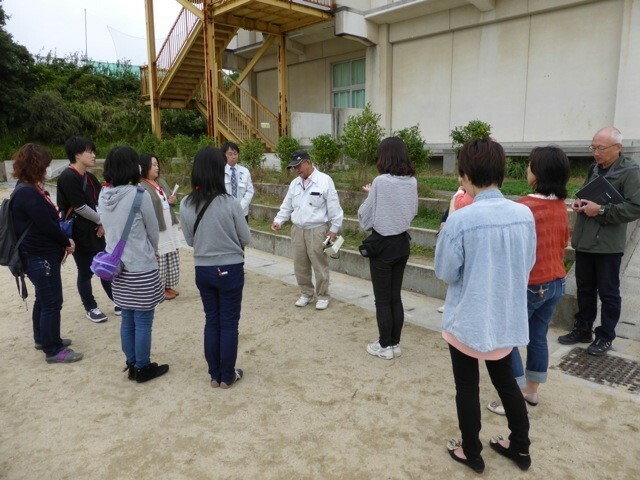 Groups such the Housewife Association (Shufuren) and Life Club (Seikatsu Kurabu) are consumer cooperatives that work to ensure safe and healthy food, as well as run campaigns on social issues such as pollution, recycling and food safety. The Housewife Association’s purpose is to “establish the rights of consumers, and protect the lives and well-being of people.” Groups such as these have avoided association with more radical labels, and in doing so, have attracted support from a wide section of society. While to a western audience, these groups of women would probably not be recognized as “feminist” since they are not fighting for their own rights. Nevertheless, they have used their social positions as mothers, housewives and women to create positive and substantial social change across the nation. In the post-Fukushima period, this has changed, as women responded to the threat and uncertainty surrounding radiation in many more urgent ways. Part of our project, Voices from Tohoku, has focused on these women’s groups, some of whom we will outline below. In Iwaki city in Fukushima Prefecture, an area just outside of the required evacuation zone, there is a small organization run by young mothers who are dissatisfied with government decontamination policies, and the Japanese government’s shoddy efforts to measure radiation levels. More generally, this group objects to the government’s continual calls for economic reconstruction and revitalization (keizai fukkō) when those efforts do not include systematic measures to protect their children and sustain a natural and productive quality of life (inochi). Active mothers feel that they cannot be seen as aggressive or (worse) emotional and irrational (shinkeishitsu); they need to present themselves as “normal” (fuutsu) mothers, who are caring for their children and responsive to the needs of the whole community. They must unify under a cause, rather than risk dividing the community. Thus, rather than marching or demonstrating, they hold “tea meetings” (ocha-kai) for concerned mothers. They appeal to other mothers “as a mother,” to create collective spaces where they openly share concerns with each other but also to hide their fear and sometimes anger that comes from being a mother in radiated Fukushima from others in the community. But in order to be heard in this yet male-dominated local government, they have learned to speak in a distinctive way, what they call a “men’s language.” This is the objectivist language of numbers and policy, the only language that the mostly male government official will listen to or understand, according to one informant. The group distributed Geiger Counters to measure radiation levels at local playgrounds and school grounds—the places that mothers know kids actually play—and report these numbers to the men in the local offices, petitioning them for better monitoring and enforcement of existing regulatory measures. Some informants say that as mothers, they can talk about the danger of radiation (because it is felt most acutely by children), but cannot address the larger issues of nuclear power (which is considered beyond the purview of mothers, part of men’s world). While these gendered positions are limiting, these tradeoffs are required of living especially in a small, rural community. This strategic shifting of register and focus, between men’s and women’s languages, is designed to ensure that these women stay within the expected parameters of the “normal”—doing what any women would do to protect her children—even as they transgress into a public sphere that is usually considered beyond their scope. As the leader of the organization put it, when spoken in a soft way, “a mother’s pure feeling of wanting to protect their children makes no enemies.” The mothers feel that this modulated approach is the best way to recruit new female members, and work smoothly with male government officials. Most of the veteran leadership in this group has some experience as political activists from the 1960s and 1970s, and see activism as an integral part of their lives. They have also been quite successful in framing the issue of nuclear energy as a “woman’s issue.” Some explain that when their government proves itself untrustworthy and their men fail to act, it is not only a mother’s obligation, but also her right, to act to protect their children and their nation. This raw demonstration of emotion is also ‘of women,’ as much as the softer talk of the organization in Fukushima. Some members describe themselves as “mubou,” meaning “reckless,” but also brave, with disregard for rules or consequences, as one might fight for children and life itself (inochi). They reject the gendered nomenclature that separates radiation from nuclear power, claiming that it makes no sense to be “against radiation” without attacking the root cause of it—nuclear plants and the nuclear industry. They reject the characterization of themselves as radical activists, turning it around: “to act, to protect children, family and life, is not strange, or even radical, it is ‘normal.’” Within this characterization, this is how normal mothers and normal women act. This is the first report of an article series about the social movements that are currently occurring in Japan. DANZUKA Haruka is a student at Tokyo University’s Graduate School of Arts and Sciences. Her research focuses on the use of trauma narrative in both state apparatus and local activists groups, as well as by “regular” mothers and women in their attempt to orient themselves in post-3.11 Japan. Maya HOUSER is a student at Waseda University’s Graduate School of Asia-Pacific Studies, researching mothers who evacuated from Fukushima to Tokyo after the 2011 nuclear accident. She is interested in the mothers’ relationships with their families and communities in Fukushima, and the new relationships and difficulties they encounter in Tokyo. UNO Satsuki is a student in the ITASIA program at Tokyo University’s Graduate School of Interdisciplinary Information. She works on youth, labor and digitality in the urban spaces of recessionary japan, and is now looking at the use of digital media in activist cultures. Please send news items, contributions and comments to SEAA Contributing Editors Heidi K. Lam ([email protected]) or Yi Zhou([email protected]).